Hotel Harsha Park Inn Bangalore, Harsha Park Inn Hotel Bangalore, Reservation for Hotel Harsha Park Inn, Bangalore, India. Address: No. 11, Park Road, Shivajinagar, Bangalore- 560051, Karnataka, India. Accessibility: 10 kms. from Bangalore Airport, 1 kms. from Railway Station, 4 kms. from Bus Stand. 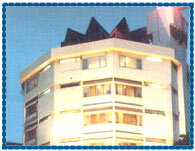 Hotel Harsha Park Inn International is the most centrally located business hotel in Bangalore. Hotel offers the quality service, warm hospitality, and efficient service at a reasonable rate. DVD Player on Demand, 59 Channel Cable/ Satellite TV, Hair Dryer, Safe and Locker Facility, Refrigerated Mini Bar, Snack Basket, Twice-daily Housekeeping Service, 24 Hour In Room Dining, Laundry/ Dry Cleaning, Business Services, Wi-Fi High Speed E-mail and Internet Access, Transformers and Plug Adapters, Voice Mail, Secretarial Services.